Willow Grove Street (Route 604), 2 miles east of Hackettstown or 7.5 miles west of Route 206 on Waterloo Road (Route 604). The Musconetcong River, an excellent freshwater fishing spot, flows over and around boulders through Stephens State Park. An easy walking, but rocky path follows the river with places for picnicking in shaded areas. Less than one mile east along Waterloo Road at Saxton Falls are the remains of one of the Morris Canal’s twenty-three locks and a section of the old canal’s towpath. The original canal was 90 miles in length, stretching from Newark to Phillipsburg, and was used to ship coal and iron across the state. However, the canal could not compete with the development of the Morris and Essex Railroad in the late 1800s, and the canal was eventually abandoned. The Stephens State Park facilities are partially accessible for persons with disabilities. Please contact the park office at (908) 852-3790 for further information regarding disability access needs. Text telephone (TT) users, call the New Jersey Relay Service at (800) 852-7899. Office Hours: Monday through Friday 8 a.m. to 4:00 p.m.
April 5, 2019: The Group Picnic Shelter is closed for the month of April due to plumbing repairs. We are sorry for the inconvience. If you have any questions please call the park Office. There are six miles of marked trails at Stephens State Park for walking, hiking, mountain biking and horseback riding. The trail surfaces range from flat to steep and rocky. A 2-mile section of the Highlands Trail runs the length of Stephens State Park. Campsites: Forty tent and small trailer sites with fire rings and picnic tables. Flush toilets and showers are within walking distance. Open April 1 through October 31. New Jersey Residents: $20 per night; Non-Residents: $25 per night. The Musconetcong River provides excellent trout fishing. During the spring the Division of Fish and Wildlife stock the Musconetcong River with brown, rainbow and brook trout. Fly fishing is a popular activity. More then 470 acres are open to hunting at Stephens State Park. 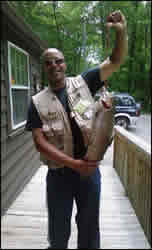 Fishing and hunting are subject to NJ Division of Fish and Wildlife regulations. Electric motors and gas motors boats are allowed to be on the Musconetcong River. Each person must have on a wearable Coast Guard approved Personal Floatation Device (PFD). Alcoholic beverages are prohibited. Picnic sites are available along the scenic Musconetcong River and at the upper picnic area. Tables, charcoal grills and sanitary facilities are provided. Playground equipment and a small open play field are available at the upper picnic area. All picnic facilities are on a first come first serve basis, except for the group picnic shelter which can be reserved. Alcoholic beverages are prohibited. Can I obtain a permit for alcohol? No alcohol is permitted in ANY New Jersey State Park. Permits are not available. Do I need a fishing license? Yes. All visitors have to abide by Division of Fish and Wildlife regulations. Do you have cabins? Stephens State Park only provides family campsites.